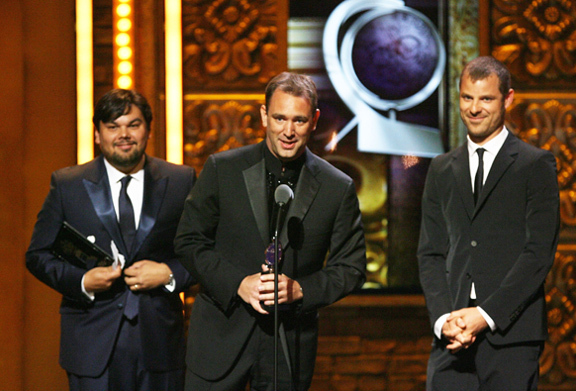 Trey Parker, Matt Stone, and Robert Lopez: The 2011 Boggs-Doniphan Gentiles of the Year! January 15, 2012 by Cynthia L.
Note: if we had bothered to make a trophy for this award, it would have been way cooler looking than the Tony trophy. Today, I come not to bury the Book of Mormon Musical creators Trey Parker, Matt Stone, and Robert Lopez, but to announce that they have been named the 2011 Boggs-Doniphan Gentiles of the Year. To the extent that an award half-named for the man who tried to have us all killed, and half-named for a valued ally, can be considered an honor, I say to them: Congratulations! So the question of the hour must be, is this year’s award a Boggs, or a Doniphan?